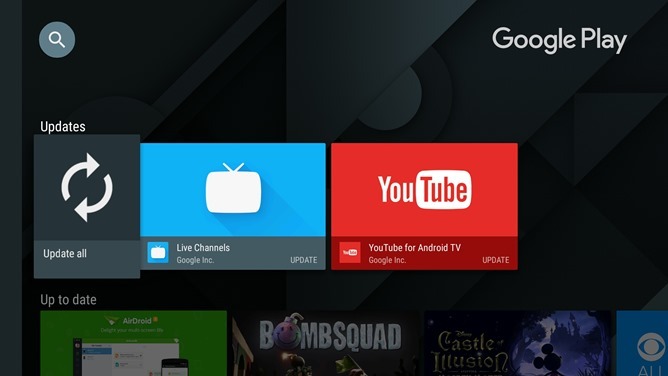 Google seems to be doing a lot of tinkering on the basic interfaces of Android TV, if only because the company's experience with television UIs is less extensive than it is on smartphones and tablets. Yesterday an update to the "leanback" launcher (Android TV's default home screen) added the ability for users to manually rearrange app icons. Today the Android TV version of the Play Store gets a slight adjustment as well: the "update all" button is back, baby. If you'll recall, the last major update (from just over a month ago) gave the entire store interface a new look. For some odd reason, the refreshed layout omitted the user-facing "update all" button for apps and games. The new version slips it back in: head to the "My Apps" section of the left side menu, and the first horizontal row is reserved for "Updates." In version 6.0.2, it includes an "Update all" button right there in front. Press it and every one of your apps that needs updating will be off to the races (unless it's on a staggered rollout). There don't appear to be any other major changes in this release, despite the version bump. As usual, the app isn't rolling out to everyone at once. You can use the APK Mirror links below to get the file and install it manually, but be aware that at the moment it's causing server errors on the SHIELD TV (or at least on mine).